Marvel Two-in-One #11 review: The real reason Reed Richards needed the world to believe he was dead – AiPT! Hint: It wasn’t really about Ben and Johnny. The non-story in Marvel Two-in-One #10 begged the question, “Why does this series still exist?” The answer might be, “to get to #11!” Is it good? Ben Grimm might still be on (this version of) Battleworld, but he’s re-Thinged and REED RICHARDS is finally here to meet him! Not a dream! Not a hoax! But he is alone. And they use that one-on-one time to really has their sh*t out. Why did Reed let Ben believe they were dead? Even the KIDS, man. You couldn’t have sent a text or DM during all that time recreating universes? Well, as we know, Reed feels the need to fix everything. And there’s one thing, back on Prime Earth, that is so unfixable, if there were ANY chance for it to work out, Ben couldn’t know. And besides, did you really want to deal with all that science beep bop? Yes, in Marvel Two-in-One #11, Reed Richards still has a problem with assumptions. He assumes Ben wouldn’t want to explore with him, Sue and the kids, and he’s kind of proven right in a delightful dialogue device by writer Chip Zdarsky, in which the Thing’s attention wanders while Mr. Fantastic is talkin’ science. But Zdarksy shows while he tells, and Ben is partially right, too, as the pair need to work together to fight off the inevitable murderous angiosperm one encounters on such expeditions. Still too, though, Reed’s decision is clearly, finally seen as the correct one, not because of where he was, but where he wasn’t. As seen in another universe, Richards’ absence lets a certain other individual divert his own attention properly and achieve his real potential. It’s beautifully emotional, as Zdarsky is at his best, but “fix everything” does feel more like a cover of Civil War and Jonathan Hickman’s Fantastic Four run than an homage. Maybe the lack of prominent FF stories in recent decades makes the few parts that genuinely stand out the only ones returning to. Either way, the story is very well done and legitimately moving, even if the premise feels tired. Artist Ramón K. Pérez does a better job with facial expressions, though the bulging baby blues on the ever-lovin’ Thing may be a bit much. Federico Blee uses a darker color palette than in previous issues, so we don’t get to see his bright fire, but the purples are surreal and Kirby-esque enough to satisfy. 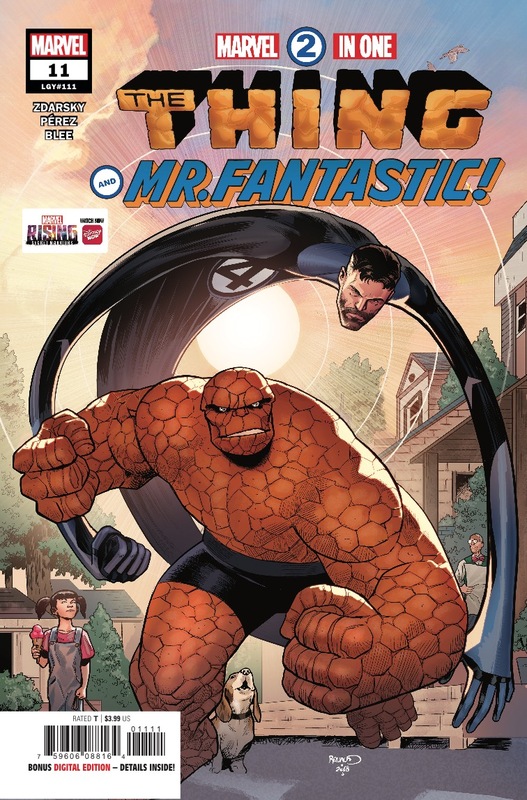 Marvel Two-in-One #11 doesn’t reach the grandest heights that Zdarsky has previously achieved, but it still tugs the heart strings and gives the reader hope for better futures for all. The art isn’t perfect, but it is evocative of early Fantastic Four stories and helps communicate the narrative. In a run that’s swung from “legendary” to “blech,” with not much in-between, #11 settles well into the “damn good” range.